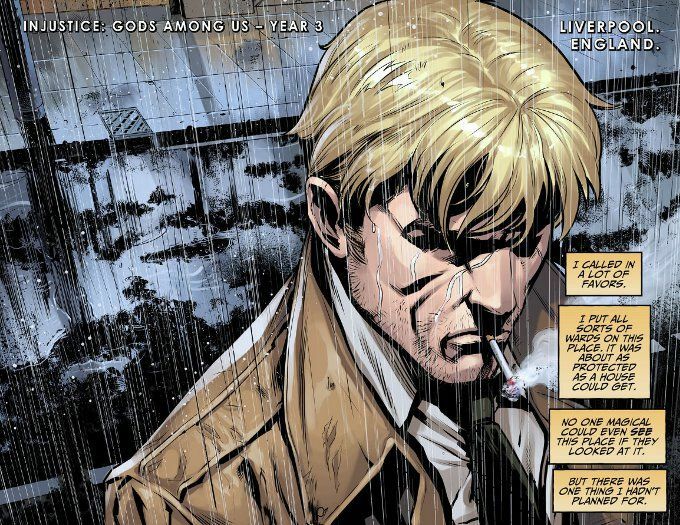 John Constantine has never been one for getting involved in noble causes. When Duty Calls, you can usually find John running the other way. But Superman's war with the Green Lanterns has changed many things and killed a lot of innocent people. And while he's not one for getting involved in noble causes, John Constantine also isn't one for letting bullies get away with murder. Throw in a new magical menace that has been awakened by Superman's actions and John has ample reason to get involved even before things get personal. So the rest of the world had best be wary. For when John Constantine gets involved in things, it usually means that a bad situation is about to become a whole hell of a lot worse. Any fears that might have existed about this series dipping in quality as it shifted in gears from super-heroic space opera to street-level mysticism prove completely unfounded. Tom Taylor rounds the curve into the new series effortlessly and his decision to focus this year upon DC Comics' magical heroes and their response to Superman becoming a tyrant is proving to be an interesting one thus far. John Constantine is the perfect central character for this story, being both an every-man figure the newer readers can identify with but also one of the few characters who can play comedy and horror with equal effectiveness - an essential trait in this series! The artwork by Bruno Redondo and Xermanico is as wonderful as ever. The characters are all well designed and the action of the story flows naturally throughout. 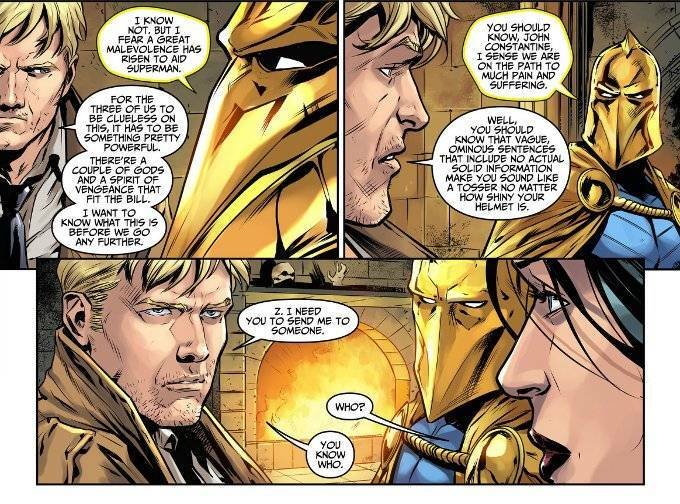 Colorist J. Nanjan creates some rather impressive effects throughout, particularly the light reflecting off Doctor Fate's helmet. And because I don't think I've ever praised it before, let me say that the lettering by Wes Abbott is quite lovely and easy to read.